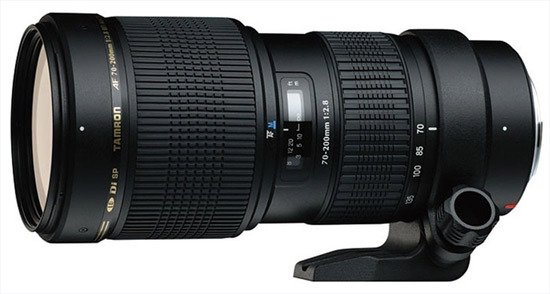 This is a zoom lens manufactured by Tamron and the model was launched 2008. If you buy this lens it will come with a lens hood, whose model name is "HA001". Tamron´s SP 70-200mm F/2.8 Di LD (IF) Macro exemplifies the second of the two zoom focal lengths considered essential by many professionals. At just 7.6 inches long and weighing only 40.6 oz., long days of shooting become easier and extraordinary optical design and exacting manufacturing assure the image quality that makes long shoots rewarding. A fast and constant F2.8 maximum aperture, renders cluttered backgrounds well out of focus, extends low-light shooting freedom and enables a brighter viewfinder image. Its IF (Internal Focus) mechanism maintains a fixed barrel length throughout the focusing range and superb optics, featuring LD (Low Dispersion) glass to assure remarkable image quality. The 70-200mm F/2,8 complements the extremely successful concept of the Tamron 28-75mm F/2,8 and extends the focal length range to 200mm. Particular attention was placed on top quality combined with high luminosity and compactness as is the case with the award-winning 28-75mm and * SP lenses in general. In spite of its compact construction, the 70-200mm is packed full of features, which permit creative picture taking in all situations. The professional image quality also does justice to demanding photographers. Extreme sharpness, resolution and brilliance are its trademarks. Moreover, it is the best of its class in the categories minimum focus distance (only 0.95 m in the entire focal length range) and a magnification ratio of (1:3,1). When using full frame cameras the medium tele-range of 70 mm to 200 mm is completely covered. When used together with APS-C sized cameras, the lens offers an equivalent of 109 mm to 310 mm arises (referring on the angle of view of the full frame) **. Whether for nature, sport or people-photography, the extraordinary optical performance will inspire you. ** Tamron uses a factor of 1.55 for the conversion to full frame. The designation “Di” (Digitally Integrated Design) marks a generation of lenses, which have been specially adapted to the higher requirements of digital SLR cameras (APS-C and full frame). "